A story about having faith, losing it, and finding it again through science—revealing how the latest in neuroscience, physics, and biology help us understand God, faith, and ourselves. Mike McHargue, host of The Liturgists and Ask Science Mike podcasts, understands the pain of unraveling belief. 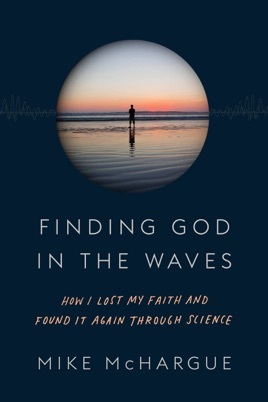 In Finding God in the Waves, Mike tells the story of how his Evangelical faith dissolved into atheism as he studied the Bible, a crisis that threatened his identity, his friendships, and even his marriage. Years later, Mike was standing on the shores of the Pacific Ocean when a bewildering, seemingly mystical moment motivated him to take another look. But this time, it wasn't theology or scripture that led him back to God—it was science. Full of insights about the universe, as well as deeply personal reflections on our desire for certainty and meaning, Finding God in the Waves is a vital exploration of the possibility for knowing God in an age of reason, and a signpost for where the practice of faith is headed in a secular age. Among other revelations, we learn what brain scans reveal about what happens when we pray; how fundamentalism affects the psyche; and how God is revealed not only in scripture, but also in the night sky, in subatomic particles, and in us. Having grown up a Southern Baptist, McHargue, creator of Ask Science Mike and The Liturgists Podcast, once believed that faith and science were mutually exclusive ways of understanding the world. As a child and young adult, he drew strength and authority from his Christian evangelical church community, yet privately he began to doubt the core tenets of fundamentalist Christian faith. This book chronicles his personal journey through a period of atheist rejection of religion, followed by a return to a very different type of Christian practice. Through the lens of neuroscience, McHargue makes his case for valuing religion not for its factual explanatory power but rather for its ability to give meaning to human existence. Like many personal narratives, this memoir will be most appreciated by readers who share the author's struggle to square a rational, material understanding of the universe with an irrational yearning for the transcendent. For those who have grown up in a faith tradition that does not demand the reconciliation of evolutionary science and creation stories, this volume will likely seem an unnecessary exercise. Yet for those who fear science will rob them of both God and Christian community, this work may offer much-needed hope that Christianity and science can coexist. In a humble and personal way, Mike shares his journey from Southern Baptist to atheist to Christian Mystic and creates a safe space for wrestling with our deepest questions about God and science. "Finding God in the Waves" is a powerful resource for transcending false divisions and finding a sense home in the great mystery. Inspiring book that speaks to my broken empiricist heart!